Michael Kennedy is an award-winning sommelier and vintner. He got his start in the wine industry at an early age, working for our Missouri estate winery when he was just 21, then moved on to become the sommelier for Ritz-Carlton Hotels in Washington DC, before moving on to the Cayman Islands to assume the role of Head Sommelier, along with directing the wine program for celebrity chef Eric Ripert. 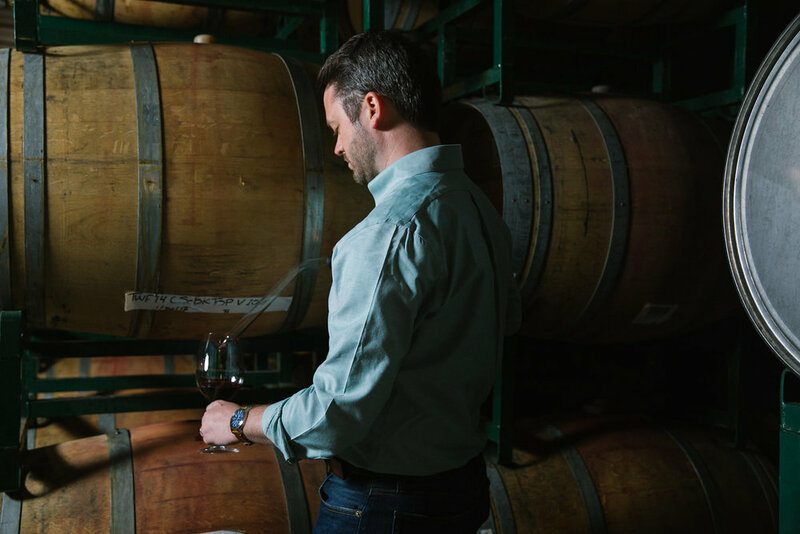 In 2016, Michael and his wife Rachel, yearning to get back into the winemaking side of the business, moved back to the US to start their winery in Napa Valley, Component Wine Company, a boutique negociant, producing 100% varietal wines. Since founding the winery, he has been named Forbes 30 Under 30 and his winery has been featured in Forbes, Bloomberg, Business Insider, Food & Wine Magazine and Barron’s. Our company is led by the incredible executive committee made up of three guys with a shared passion for entrepreneurship, wine and good times: Andy Kohn, Kirk Young and Rick Toman. Andy (left) has founded multiple companies across different design and production fields, including most recently a family of winery restaurants. He and his wife Dee Dee are also quite avid wine collectors, having collected and visited some of the best estates in Burgundy, Bordeaux, Champagne and Napa. Rick (right), also an entrepreneur, has a background in industrial production, bringing an expert set of skills to our production, management and strategic business planning. Kirk (center) is an accomplished executive in the pet-food industry, having built, developed and sold some of the most successful brands in the world. Together, they have lead and stewarded our brand and company to incredible heights. Our young, dynamic duo of Michael Kohn and Charles Miller is only a hint at our bright future. Michael is our Brand Ambassador, traveling around the country exposing new markets to our passion project, along with developing long term friendships and partnerships with distributors and private clients. Charles is our Wine Manager on-site, leading the tasting room team, along with training staff and ensuring our products are represented to the highest of standards. Charles is Kennedy's right-hand man for wine production as well, having passed his first level of Sommelier Certification through the Court of Master Sommeliers. He is also an accomplished concert trumpet player, having studied and played with some of the best in the music industry.